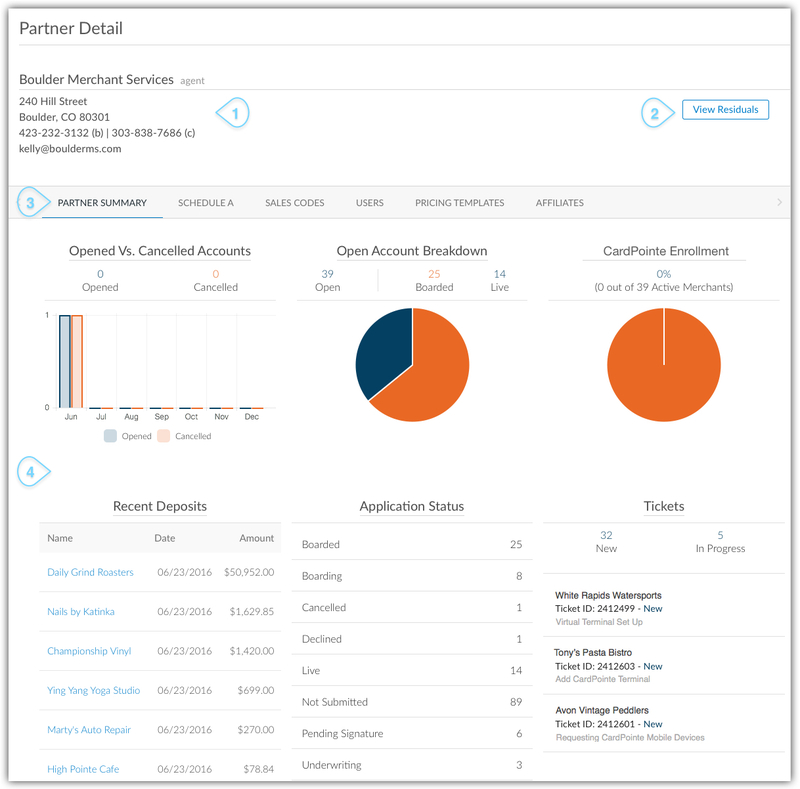 CoPilot is a customer and account management application that allows CardConnect’s partners and agents to easily manage their portfolios, as well as to communicate with CardConnect’s Underwriting, Partner Solutions, Merchant Solutions, and Technology teams. Merchants are referred to as customers. A customer can have one or more Accounts/Merchants IDs. Accounts/Merchant IDs (MIDs) are synonymous with one another and are referred to as accounts in CoPilot. Accounts can have one or more products and/or services. To access CoPilot, navigate to https://copilot.cardpointe.com and enter your login credentials. Your CoPilot and CardPointe login credentials are the same. "Account is temporarily disabled. Contact admin or try again later." The Dashboard provides a high-level overview of your business's key performance indicators and provides easy access to various useful business management features, including Pricing Templates. Refer to the image below and the corresponding descriptions to understand how to navigate this screen. Partner Detail Card - Displays your business contact information. 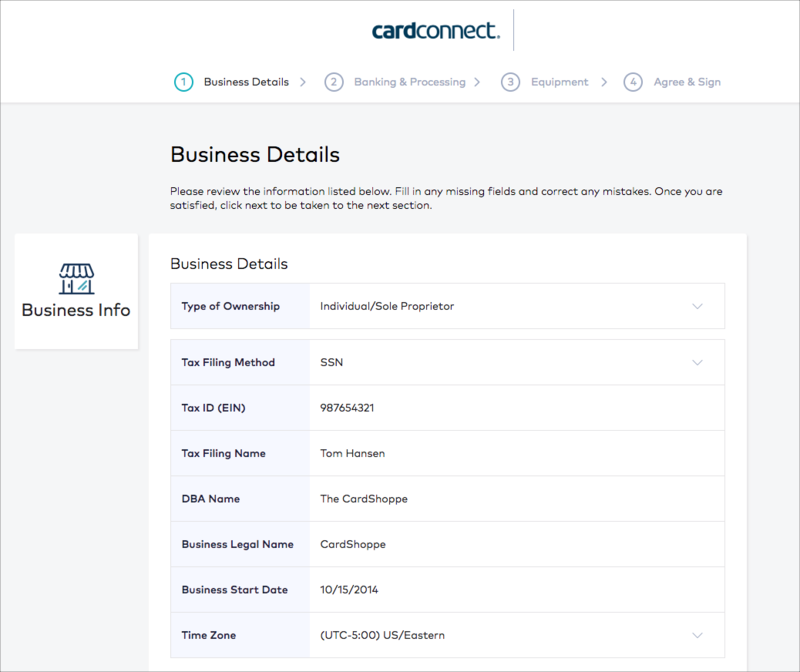 CardConnect provides this information to merchants upon request, so it is important that this information is accurate. View Residuals - Click to view your residual reports. Residual reports are also accessible by clicking Residuals in the left nav of CoPilot. Partner Summary - Displays visual graphs that provide a glimpse into your key performance indicators. Schedule A - Displays a list of schedule A information. Sales Codes - Displays a list of sales codes. Users - Allows you to add, edit, or delete CoPilot user accounts. In addition, you can configure each user's permission settings and email notification settings, giving you complete control of how your users interact with CoPilot. Application Templates - Allows you to create reusable templates that contain pre-populated products and pricing information. Affiliates - Display a list of your business affiliates and their contact information. Key Performance Indicators - Graphs and tables that provide a high-level view of important business metrics. 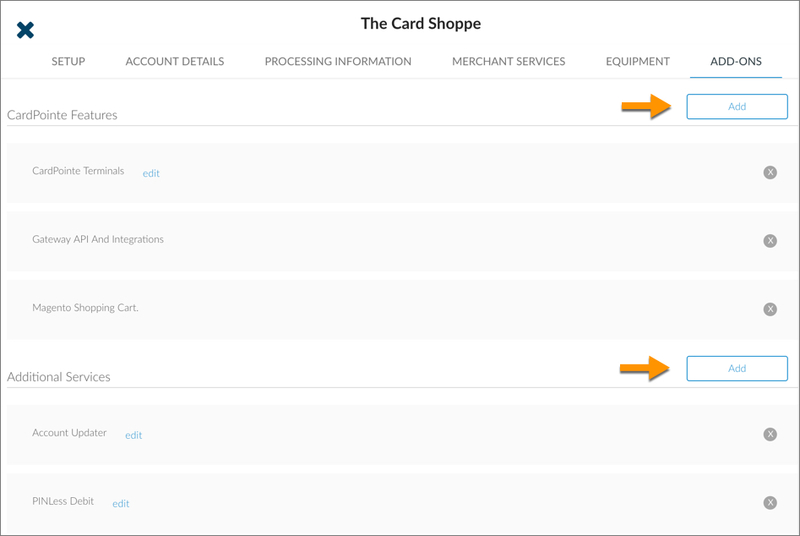 Selecting a merchant name within the Recent Deposits table displays the Merchant Detail card. Selecting an entry from the Tickets table displays that ticket's support information. 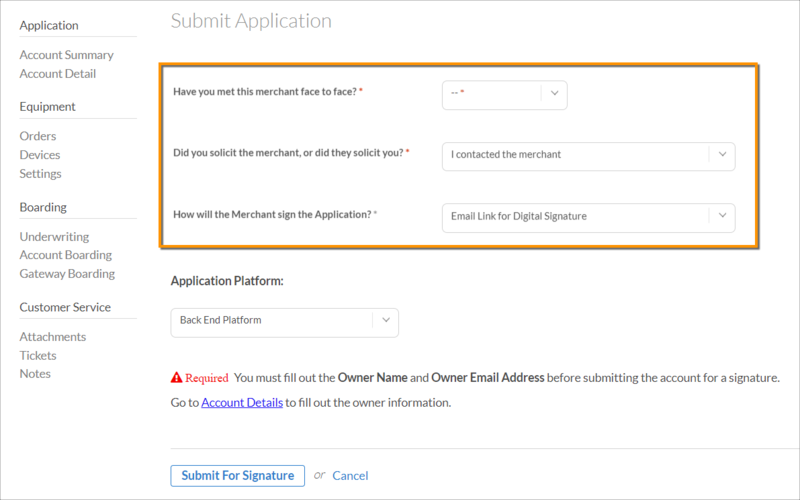 The merchant application process is now completely digital, making it easy to submit and track applications within CoPilot. 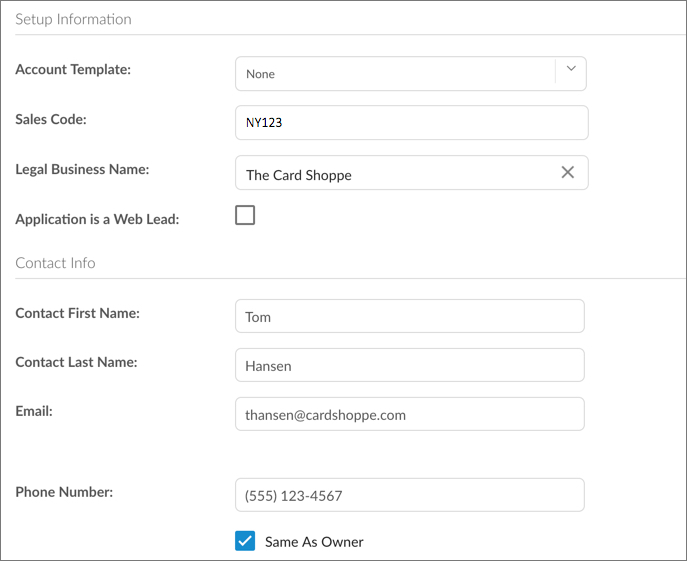 Create an account for the customer in CoPilot. Upon completing the necessary fields in the online application, click a link that triggers CoPilot to send the online application to the customer for review. 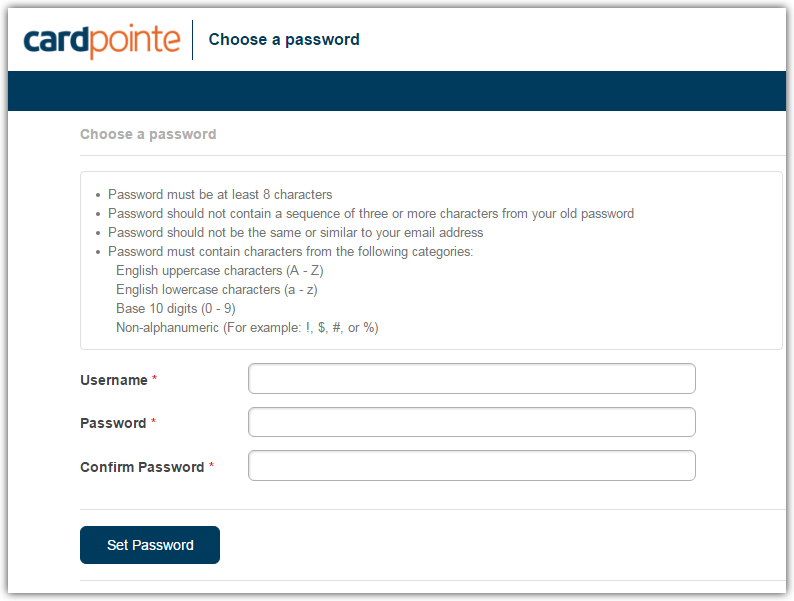 The customer receives the email and clicks a link, prompting them to create a CardPointe account. Upon creating a CardPointe account, the customer reviews the online merchant application. If everything looks good, the customer agrees to the application by digitally signing it. CardConnect receives the online application for review. Note: As part of this application process, merchants must have a valid email address in order to process payments with CardConnect. 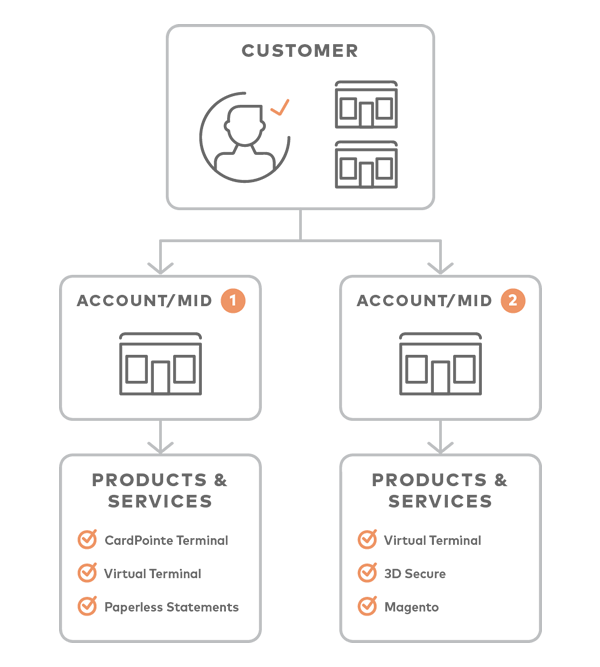 Follow this process if a customer record does not yet exist in CoPilot for the account that is being created. In this scenario, a customer account already exists for the account that is being created. Following this process saves time since you can leverage existing customer data, expediting account creation. Click New Account in the top nav. If you wish you use an existing application template, click the Account Template dropdown and select the desired template. In this example, an existing application template was not selected in an effort to show you how to complete an application from scratch. Upon completing the information on these respective tabs, click Save. Now that you have added all of the necessary and supplemental information to the account, you are ready to send the application to the customer for review. On the Account Detail screen, click Submit. Have you met this merchant face to face? Did you solicit the merchant, or did they solicit you? How will the merchant sign the application? At the bottom of the screen within the Submit Application section, click Submit for Signature. After submitting an account application for signature, the customer will receive an email at the email address that was provided in their account details. 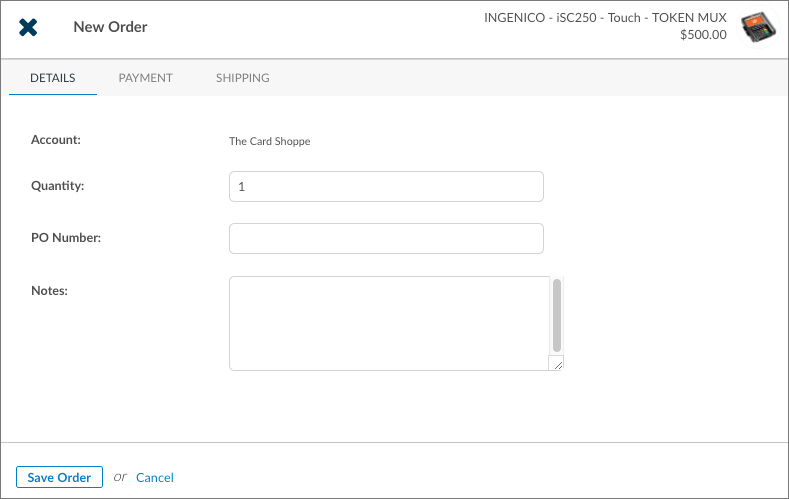 Please feel free to notify the customer that they can expect to receive an email from CardConnect. To help guide the customer through the application review process, refer to Guiding the Customer Through the Application Process. Click Sign my Application in the email that was sent by CardConnect. Upon clicking Sign my Application in the email, the customer is taken to a basic account creation form that prompts them to create a username and password. After entering a username and password, click Set Password. The customer is taken to their My Account page in CardPointe, which lists any accounts that require their review. Click the Review/Sign button. The online application displays and walks the merchant through the various sections of the app that require their review, including their Business Details, Banking and Processing information, and any Equipment that they wish to choose. Upon scrolling through and reviewing the account application, the merchant must agree to the terms and digitally sign the application. 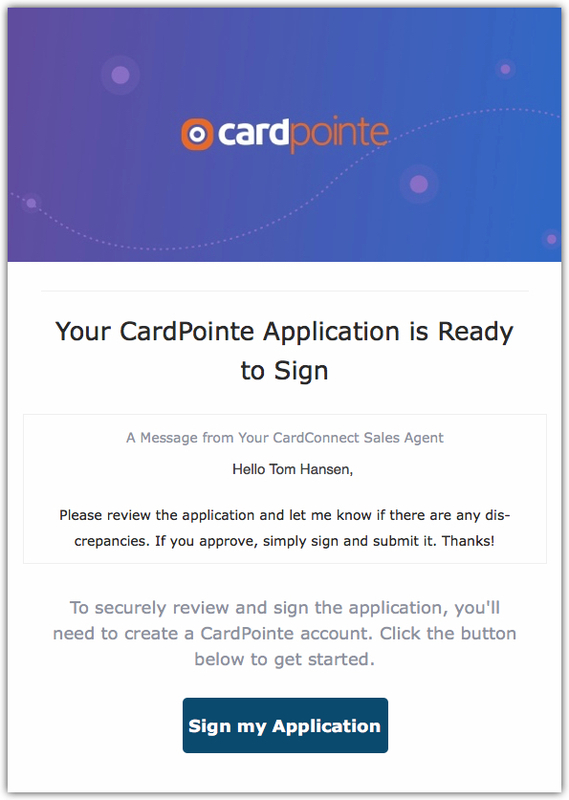 After signing and submitting the application, the account is submitted to CardConnect for review. When adding a new account for an existing customer, you can save time by reusing account details from the customer's existing merchant account(s). Click Customers in the left nav. Search for and select the desired Customer ID. The Customer Detail screen displays. 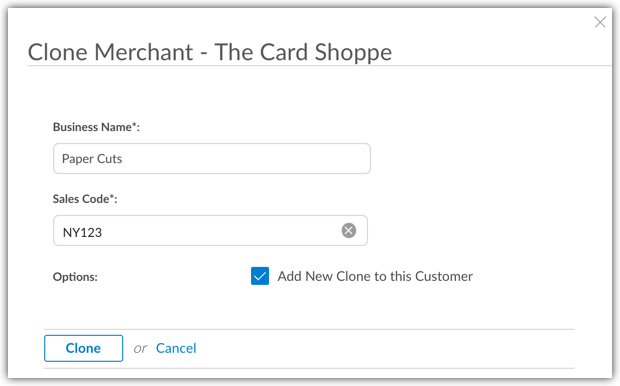 From the Create Account screen, click Clone Primary. The existing account information is copied into a new account, allowing you to continue to create the account. Note: After cloning an account, see Creating an Account for information on submitting the account. Click Customers in left nav. 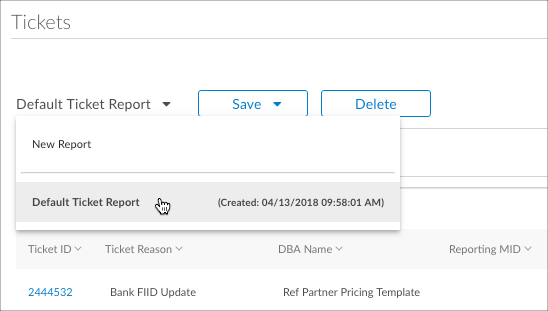 Search for the customer and either click the status of the account under the Account Status column, or click the name of the account under the DBA Name column. The Account Summary screen displays. Enter the name of the new account in the Business Name field. Click Clone. The existing account information is copied into a new account, allowing you to continue to create the account. 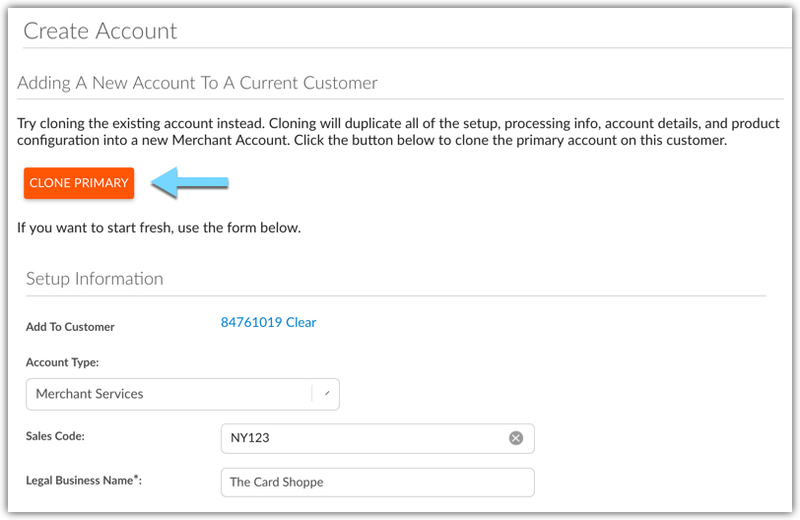 Please note that if you just wish to copy an existing account and you do not want the newly cloned account to be linked to the existing account, simply uncheck the Add New Clone to this Customer box. Application Templates allow you to create reusable templates that contain predefined merchant services product features, CardPointe product features, and pricing fields. Application Templates are useful if you have merchants that run similar business types. 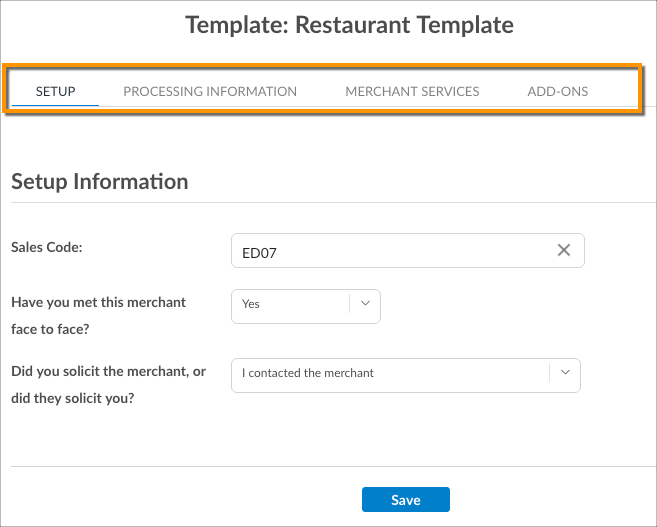 For instance, if you service numerous restaurants and other merchants in the food services industry, you can create and reuse an application template that is specific to those business types, streamlining the application process. Click Dashboard in the left nav, and then select Application Templates. Enter a name for the template in the Template Name field. For instance, if this is a template that you wish to reuse for restaurant applications, you may choose to name it "Restaurant Template". Enter your sales code in the Sales Code field, and click Save. To configure the template to your needs, complete the information within the Setup, Processing Information, Merchant Services, and Add-Ons tabs. Note: Application Templates can be modified at any time. Simply navigate to Dashboard > Application Templates and select the desired template from the list. Search for and select a customer. The "Account Summary" screen displays. Click the Orders link in the left nav. If you know the name of the device, you can search for it using the Search bar. You can also scroll through the devices to locate a device. Click Order next to the device that you wish to order. The "New Order" window displays. Complete the information on the Details tab, and then proceed to the Payment tab. On the "Payment" tab, choose how you'd like to be billed from the Billing Frequency and Bill To: drop-down menus. On the "Shipping" tab, enter the shipping address for the order and choose the Shipping Method (Standard or Expedited). When finished, click Save Order. The order is submitted to CardConnect and an email is sent to the customer confirming the order. Locate the shipped order and click its Order ID. The order's tracking number displays at the top of the Order window. 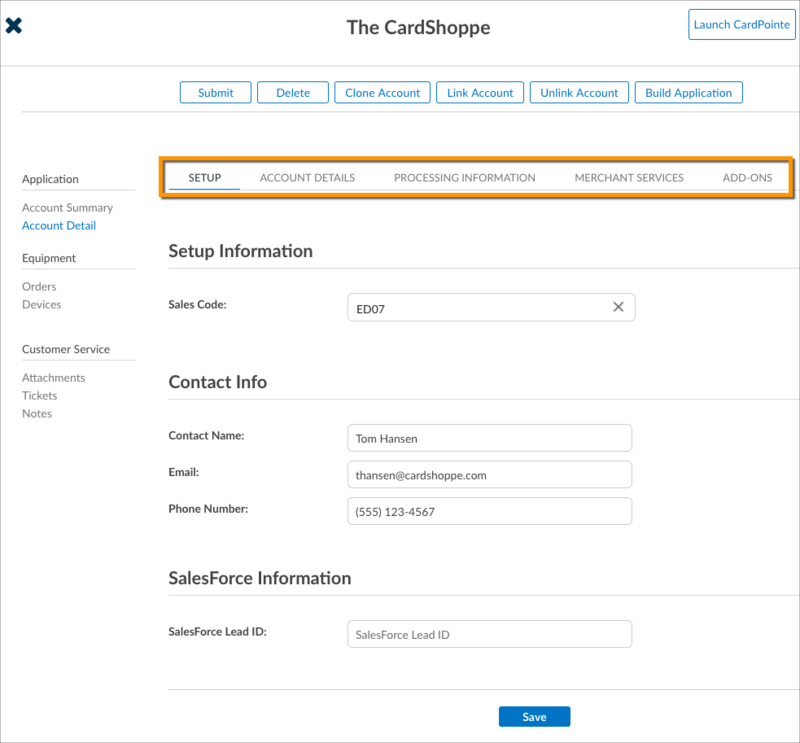 You can add various CardPointe features and other services to a merchant's account from the Add-Ons tab on the Edit screen. Search for and select a customer. The Account Summary screen displays. Click Edit to display the Edit Account screen. Click Add next to each feature and/or service that you wish to add to the account. A CardConnect support representative will review the request and will contact you via the CoPilot ticket with the next steps. You can review the CardPointe Features and Additional Services associated with the account from the customer's Account Details screen. CoPilot provides transparent, line-by-line residual reports that are always available to you within the application. The level of detail in the residual reports provides the assurance that you need to trust that you are being paid accurately. CoPilot calculates the residuals for your sub-agents and provide line item details for your individual teams. To access your residuals, click Residuals in the left nav. You can search for residuals by month by clicking Processing Period and checking the box next to each month that you wish to view. Note: The ability to view residuals is based on your user role in CoPilot. Refer to Managing CoPilot Users for more information. CoPilot's support ticket system allows you to communicate directly with our dedicated in-house support teams. 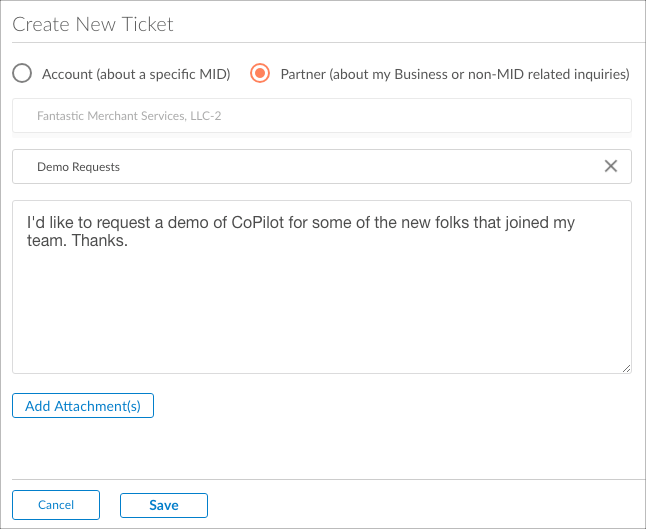 Each CoPilot ticket corresponds to a specific CardConnect Operations department to ensure you receive the proper assistance from the appropriate team. Account support tickets should be used when you have questions or requests that relate to a specific Account/MID. 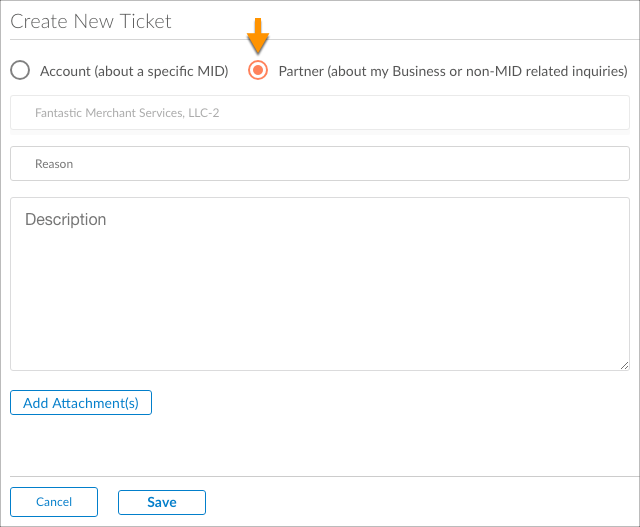 Partner support tickets should be used when you have questions or requests related to your business, as well as for other non-MID related inquiries. Click Create Ticket at the top-right of CoPilot. Ensure that the Account radio button is selected. Click the Account field and choose the account that the support ticket applies to. Click the What type of ticket are you looking for? field and choose the type of support request that you'd like to open. Click the Reason field and choose a reason for the ticket. Enter a description for your request. If you have file attachments to upload, click Add Attachments and upload them to the ticket. When finished, click Save. A member of our support staff will respond as soon as possible. Click the Partner radio button. 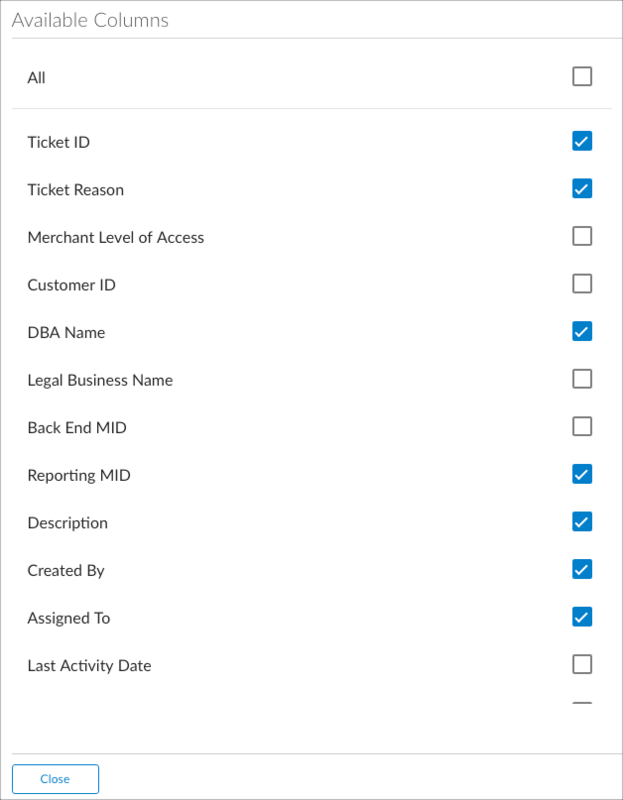 Click the Reason field to select from the list of ticket reasons. Navigate to the screen that you wish to customize for reporting purposes. In this example, we're going to customize the "Tickets" table. Click the New Report dropdown and select New Report. 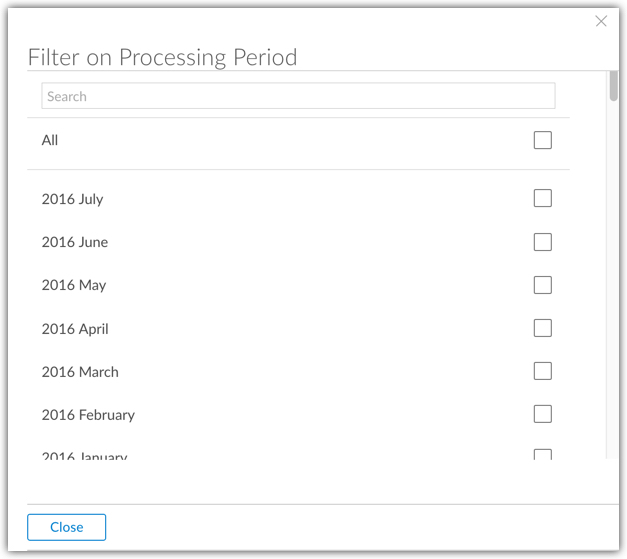 Click the Column Selector icon to customize the column filters that display in the table. Choose the desired columns that you wish to include in the table, and click Close. To save the customized table, click Save > Save As. Give the report a name, and click Save. The custom report now displays in the dropdown menu that you previously used to create the report. Navigate to the screen that contains the custom report(s) that you wish to delete. Select the report that you wish to delete from the Reports dropdown. Click Delete and confirm that you wish to delete the selected report. You can easily update your CoPilot password and your account contact information, as well as manage your subscriptions to account status changes and ticketing activity notifications by clicking My Profile in the left nav. We recommend that all CoPilot users update their notification preferences to ensure that you are receiving the desired notifications from CoPilot regarding ticket activity and account status changes for each of your sales codes. Click My Profile in the left nav, and then click Notifications. 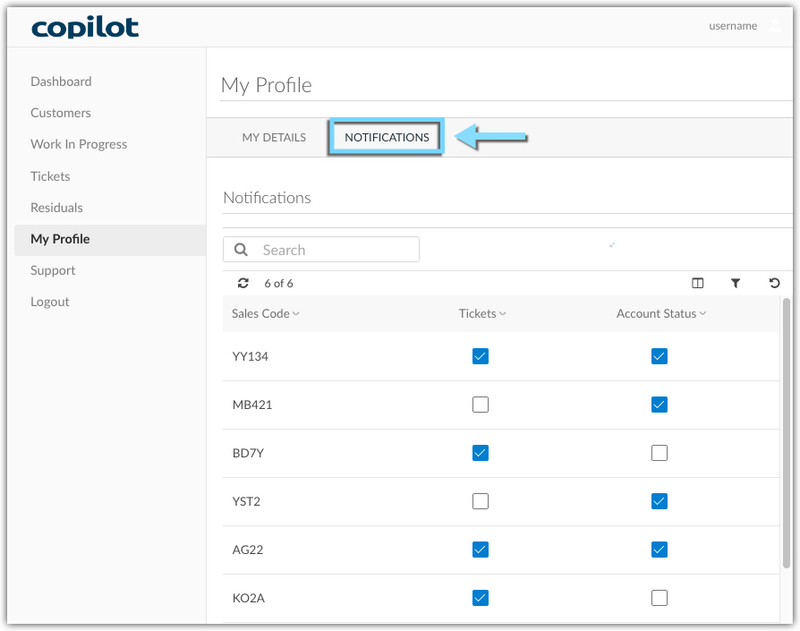 If you want to receive notifications for any ticket-related activity and any account status changes that occur in CoPilot, check the desired boxes for each of your sales codes. Your notification preferences are automatically saved. In CoPilot, each user is uniquely identified with a username, password, and profile. The user profile determines which tasks a user can perform, what data the user can see, and what the user can do with the data. Adding, modifying, and removing users is easy in CoPilot. 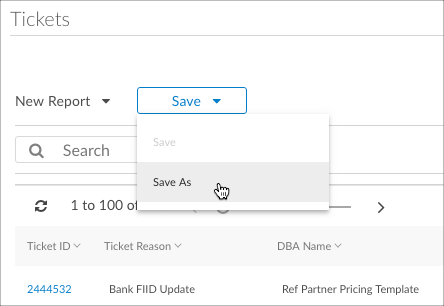 Simply click Administration in the left nav to display a list of your organization's current users. From this screen you can edit an existing user's profile and create new CoPilot users. Assigning each user to specific user roles determines the navigation menu items and screens to which each user has access. Standard users have permission settings that govern which sales codes they can view and which residuals they can view. These permissions are set at the sales code level. In addition, Standard users do not have the ability to create or modify CoPilot users.